If the eyes of your heart will be illuminated, you will find here precisely the code number that I mentioned above. It is encoded into the text in such a way that between each of its four letters lie 42 intervening letters. The wise will understand that this is not by chance, but a clear sign involving the very birth of the world. The footnote is with respect to a remark made in his commentary about four letters: בהרד. What he means in this remark is that from the first ב of Genesis and skipping 42 letters there is a ה; and skipping 42 letters there is a ר and skipping 42 letters there is a ד. And he says this is the secret to the birth of the moon, the birth of the world being a reference to the birth of the moon. Table showing the בהרד ELS with skip 42 at the beginning of Genesis. The cylinder size is 42 and there also appears ELSs of the words Beginning Birth of the Moon. In the oral tradition, in an ancient book Sod HaIbbur, it is written that the first new moon occured at hour 14 of day 6. The counting of the hours nominally begins a 6PM the previous night, which is the beginning of the next day. Hence, hour 14 of day 6 is 8AM the morning of day 6. The meaning of the בהרד can be understood by its gematria: ב 2, ה 5, ר 200, ד 4. It means day 2 hour 5 plus 204/1080 parts of the hour. In the oral tradition it is taught that it arose in the mind of God one primordial year (12 lunar months) prior to creation to create the world. One lunar year prior to the first new moon occurred on day 2 hour 5 plus 204/1080 parts of the hour. From this knowledge and knowing that the average length of the lunar cycle is just over 29.5 days, it is possible to compute the average length of the lunar cycle that has been taught in the Jewish tradition from the time of mount Sinai. Here is how the calculation goes. Multiply the truncated 29.5 days per lunar month by 12 to get 354 days per lunar year. Since 350 is evenly divisible by 7, starting from Day 2 hour 5 plus 204/1080 parts of the hour and going for 350 days brings us to Day 2 hour 5 plus 204/1080 parts of the hour. From Day 2 hour 5 plus 204/1080 parts of the hour to day 6 hour 14 is 4 days, 8.8111 hours, or 4.3671296 days. One lunar year is then 354.3671296 days. Divide this by 12 and we obtain the length of the lunar cycle as taught in the Jewish oral tradition since the time of mount Sinai: 354.3671296/12 = 29.530594. Of all the ancient cultures, which general held the lunar cycle to be 29.53 days. the 29.530594 days was most accurate. NASA in 1996 by satellite observations plugged into celestial mechanics mathematics improved this to 29.530588 days. The difference between 29.53094 days and 29.530588 days is about .5 seconds. Rabbi Chaim Michael Dov Weismandel [the Rachmad] working without computers during the 1940's and 1950's found what he regarded as significant ELSs and ELS patterns. Some of his work was later published by his students in a book Torat Chemed, after his death. In 1976, Rabbi Shmuel Yaniv began working on Torah Codes specifically with respect to religious themes. In the next table we ask a question: When did Rabbi Yaniv begin Torah Codes? In Hebrew this question is, םתי יחל יניב קוד תורה? . 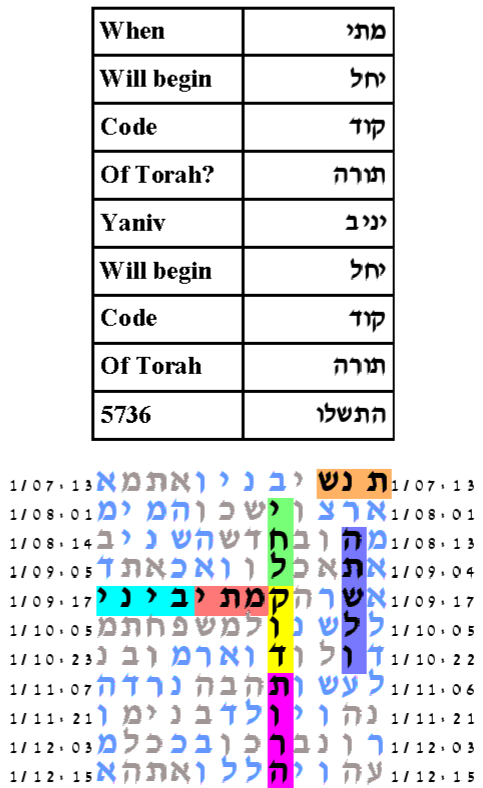 The question is answered in the table with the sentence, יניב יחל קוד תורה שנת התשלו, Yaniv will begin Torah Codes in the year 5736 (1976). Indeed that is when Rabbi Shmuel Yaniv began studying Torah Codes. His first book, Codes in the Torah, צפונות בתורה, was published twelve years later in 5748 (1988). Since then he has published four additional volumes of צפונות בתורה. The table produced by the search has a cylinder size of 632. It is interesting that 632 is the gematria of צפוןות, the plural of the word צפון, meaning code. The cylinder size is 632. This table asks the question about when will Torah codes begin? In the table is the answer. Yaniv will begin Torah codes in 5736.